"Whoo, whoo" says the old-fashioned steam engine when all nine puzzle pieces are placed in the board. Your child will "get on board" with matching and listening skills while doing this wooden puzzle with its matching picture under the pieces. This puzzle is a great puzzle for younger children. Unlike a lot of other puzzles on the market that are targeted towards younger children, this puzzle's pieces are all different shapes and fit in the puzzle only one way, helping to prevent frustration. Encourages development in matching, problem-solving, hand-eye coordination, logic, and spatial skills. 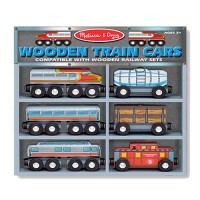 Including an engine and caboose, this 8-piece, hand painted wooden diesel train is ready to haul pas.. This innovative wooden puzzle includes nine colorful vehicle pieces that slide around a colorful tow..
Three favorite pets live in this cozy blue house and are always ready for puzzle play. This extra th..
A great first puzzle designed for ages 1 yr +! This extra thick wooden puzzle includes three a..